Originating in the rural valleys of Norway, Rosemaling is a technique that refers to the traditional style of decorative folk painting. Rosemaling’s main attributes consist of beautiful floral ornamentation, geometry, and scrollwork that spreads across an elevated piece of wood or wooden furniture. There are at least three main schools of Rosemaling which come from various parts of Norway. These styles are from the regions of Telemark, Hallingdal, and Rogaland. What the styles have in common is that each style requires a strong grasp of brush techniques and stroke work. Using the brush the result in a beautiful traditional art of flowery patterns. At Heartroom Gallery, we teach you all the stroke work you will need to know to create these beautiful pieces. Below is a short but informative guide on some of the stroke work used to achieve this classic Norwegian style. The S-stroke is created with either a round or flat brush. Using a flat brush, the S-stroke starts on the chisel end, then is pressed, and ends on the chisel end again. Using the S-stroke, two S-strokes side by side are used to represent a beautiful petal stroke seen in the Rosemaling style. The crescent stroke or a C-Stroke is achieved using a flat brush. This time, all you want to use is the outside edge of your brush to create a crescent. The inner part of your brush stays perfectly still to allow a different color that forms the center of your flower. The comma stroke is created using a round brush. 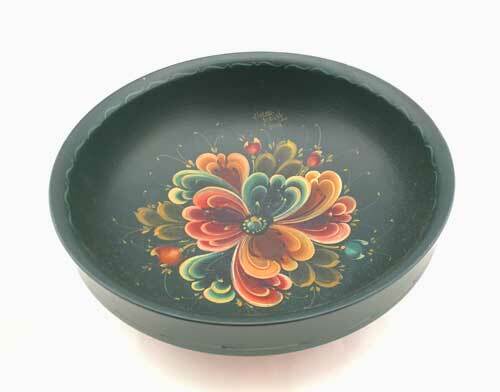 The stroke is used to make the outer petals of the flowers for the Rosemaling style. The petals are achieved by using the main part of your brush to create a comma on either side of your flower that faces each other. Brush loading is part of the skills that you will need to learn as part of the stroke work. The various colors are created by loading your brush with a dark outer color, and lighter inner to create the two tone effects. These brush stroke and loading of the colors are just some of the techniques that you will learn at the Heartroom Gallery. Flowers are the common ornaments of the Rosemaling style. A Basic Flower is created simply by two comma strokes, two S-strokes in the middle, and then finished off with a circle stroke in the middle again. This creates depth to a basic flower. The seeming movement of the flowers is created with flowing and free brush strokes. To give your flowers movement, or more dynamic appearance, use a combination of odd and even brush strokes to make some petals seem larger than others. Traditionally, masters of this style used a wide variety of colors in their flowers. The outer flower is painted with the primary color. But more importantly using whites and lighter shades in partnership with the main color for the inner part of the flower. The use of the light colors makes the inner part of any flower you’re painting to pop up, and add depth to the traditional style. The final touches of the Rosemaling style are to craft the outline of your scrolls and the pattern of your flowers by using a brush or chalk or a soft pencil if you aren’t yet comfortable with using a brush in freehand. Paint in your scrolls and make sure it is always aiming towards the root point. If you’re painting on a square piece of wood, for example, make sure each scroll aims toward the corner of the edge you’re painting. Filling in the flowers is the fun part! Now you get to combine the strokes you’ve learned to create your flowers. Many artists like to draw a simple mark along their scrolls to show where each flower will go. Remember, you want to create a pattern, but the object is not supposed to be perfect. The Rosemaling style is a traditionally freehand painting technique, which allows a lot of creativity for your flowers and your scrollwork. Detail your flowers with the proper shading and edges to round and smooth out your flowers. The main work should be done when you create your flowers by freehand. 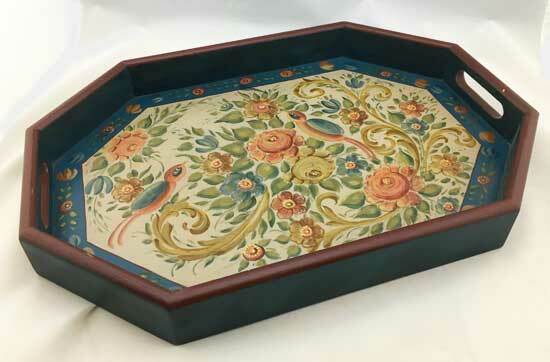 The traditional Rosemaling style is about simplicity. Therefore the flowers are not meant to be over-detailed. Once you’re happy with your flowers and the balance of your scrolls you can add a border to your piece. Many people simply use a link S stroke along the outside of their piece, but the creativity lies with you. Just be sure to keep it as simple as possible, so the attention is drawn to your scroll and flower work. 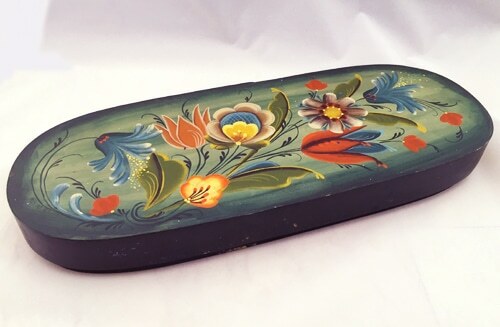 Rosemaling is an incredibly enjoyable form of painting, as long as you’re prepared to approach it with a clear mind and desire to paint freehand. This is a style where you should not get hung up on your mistakes. Heartroom Gallery allows you to let your creativity flow, and our master painter can help you to learn the stroke work with practice.